We thank you all for your continued support of the Art Base. As the Town of Basalt has only approved a 3-year lease in our current space, we greatly appreciate your encouragement of securing a long-term home for our operations. The recent article in the Aspen Times adequately summarizes the Town of Basalt’s Council meeting that took place on 9.25.18 and the discussion regarding Independence Venture’s proposed River Parcel project. https://www.aspentimes.com/news/pan-and-fork-proposal-falls-flat-in-basalt/. Though the Art Base is not a co-applicant and is not tethered to the proposal, it is a privilege to be included in the plan. We are optimistic that a solution will be reached in a timely manner and we understand that projects of this nature take time and change course frequently with considerable need for flexibility between routes. We are proud to exercise fiscal prudence through this process and have a commitment to our fiduciary responsibility both in expenditure of time and funds as we patiently and diligently work on realizing a permanent home. It is an honor to be part of the conversation regarding the future of Basalt and shaping the downtown core. We will continue to explore all of our options and maintain a concerted effort to realize a facility for the Art Base that best serves our mission and meets the needs of the community. Currently our top priorities remain focused on fostering creativity, creating equal access to visual art, supporting Colorado artists, community vitality and fundraising for our bright future. Questions or comments about strategy may be directed to Skye@theartbase.org. Great news, Independence Ventures’ proposal for the River Parcel property sailed through the first round of review by the Basalt Planning and Zoning Commission on Tuesday night! The board voted 5-1 with little deliberation to recommend sketch plan approval to the Basalt Town Council, which will start its review on August 14, to be continued on August 28. The project received universal high marks for providing permanent homes for two nonprofits—the Art Base community arts center and the Basalt Chamber of Commerce. We look forward to continuing in the public process with the goal of obtaining 7,000 square feet of “free dirt” to build our permanent home. The Art Base continues work towards making a long-term investment in Basalt’s historic downtown core by building a state-of-the-art visual arts facility. The Art Base and Basalt River Park LLC are working together to find an ideal site and terms for a permanent home for the Art Base. We are thrilled with the progress as Basalt River Park LLC has recently contracted to buy two acres of land from the Roaring Fork Community Development Corp. The conceptual vision for a revised land use plan for the parcel across Two Rivers Road from Basalt Town Hall is to receive a donated portion of the site of sufficient size, estimated at 7,000 sq feet, so that we may design and construct an appropriately sized center. 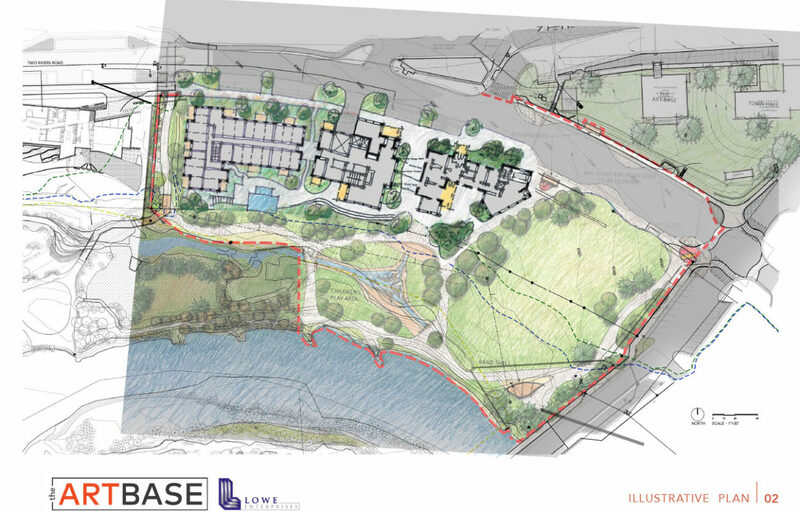 The site is unique, situated in the heart of downtown and also on the Roaring Fork River, and will become the defining element of the downtown district—a cultural anchor and a hub of creativity. The development plan will establish a set of goals and pursue a land use application that will commence this spring that will seek support of staff, council, and the stakeholders of the site. In addition to the Art Base, the site planning includes the Basalt Chamber of Commerce with a modest visitor center, residential units, and a restaurant/bar that will have the option to provide food and beverage support for special events and park goers in the surrounding area. We believe the Art Base will be an important activator to the uses and a core source of activity, and that the downtown merchants will support our involvement in the new project. We also anticipate support from the Town to extend our current lease during the transition and to also construct the road, sidewalk, and parking improvements on Two Rivers Road so that the Art Base can focus solely on the design and construction of its new facility. We are all optimistic that the Town of Basalt is rapidly closing in on a master plan resolution and together we can determine what’s best for the site. We made the front page of the local papers last week when Lowe Enterprises submitted a pre-development application letter to the Town of Basalt regarding the Pan and Fork development concept—a project that would include a new and permanent home for the Art Base. Lowe is proposing to build a 55,000-square foot condominium hotel and a separate 15,000-square foot structure to house the Art Base as well as a restaurant, meeting room, and small retail space. The proposed facilities for the Art Base will feature classrooms, an expanded gallery space, and administrative offices. The project is poised to create an important and sustainable economic stimulus for historic downtown Basalt. We are very excited about the prospect of working with Lowe Enterprises to build a new home that will allow us to grow and continue to fulfill our mission to foster creative expression for all ages and abilities while we create community vitality through the arts. We believe the proposal contains the critical elements of compromise, which will hopefully satisfy most participants in our ongoing community debate about the future of the CDC land parcel. We, of course, understand that more will have to be learned about the details of the proposal, but for now this looks like an excellent start. For questions, or with inquiries regarding how you can show your support, please reach out to genna@theartbase.org. We will be sure to keep you updated as the project progresses. The Art Base wishes to make an investment in Basalt’s historic downtown core and provide a state-of-the-art visual arts facility that will further enhance the Our Town Planning work that is on-going for the community of Basalt and reaches out to the entire valley of residents and tourists alike. 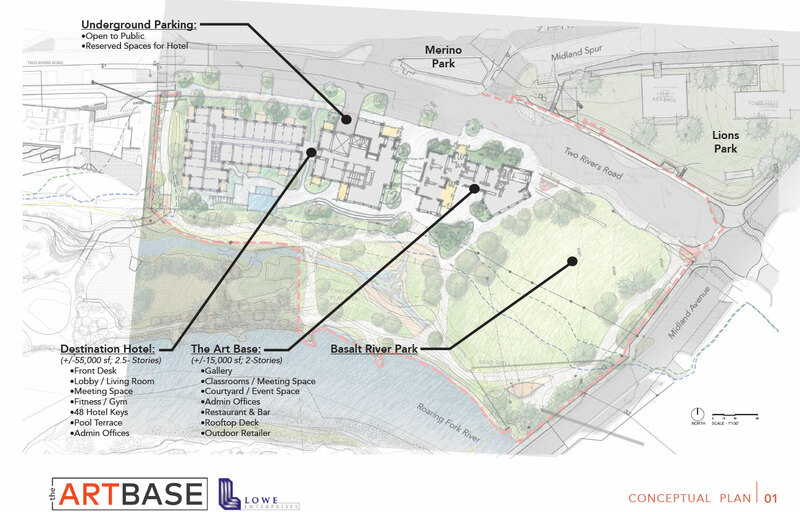 The Art Base building will be a cultural anchor for the Town of Basalt and a leading facility for the Basalt River Park, Lions Park and Merino Park—offering new programs to attract both artists and art enthusiasts. This facility is thought to become a win-win for the Town of Basalt, the Art Base and artists from the valley and beyond. High caliber exhibition space for Colorado-based artists! Community classrooms and digital lab! New live-work artist and intern studio apartments! Multi-use courtyard and events space! We aim to launch a capital campaign in 2017 and are currently working to finalize the best Basalt location for the project. Building design funded in part by Design Assistance Grant from Community Office for Resource Efficiency.